Meigs junior Jake Perry, left, runs with the football while dragging Point Pleasant defender Jovone Johnson (11) during the first half of a Week 8 gridiron contest in Point Pleasant, W.Va.
Last Week: Alexander lost to Trimble 38-0, in Glouster; Meigs lost to Wellston 45-43 OT, in Wellston. Last meeting between the teams: Oct. 28, 2016. Meigs won 41-15 in Albany. AHS offense last week: 13 rushing yards, 55 passing yards. MHS offense last week: 221 rushing yards, 123 passing yards. AHS offensive leaders last week: QB Kaleb Easley 3-11-0 55 yards; RB Brad McCollister 8 carries, 33 yards; WR Conner Kimbrough 2 receptions, 37 yards. MHS offensive leaders last week: QB Zach Helton 13-18-0 117 yards, 3TDs; RB Zach Bartrum 29 carries, 153 yards, 1TD; WR Zach Bartrum 6 receptions, 63 yards, 2TDs. AHS defense last week: 180 rushing yards, 125 passing yards. MHS defense last week: 373 rushing yards, 20 passing yards. 1. The Marauders own a 27-5-1 record over AHS in all-time meetings. Alexander’s last trip to Rocksprings was on Oct. 30, 2015 and resulted in a 35-26 Spartans victory, their only victory over the Marauders in their last five meetings. 2. Since a 42-6 victory over Federal Hocking in the season opener, Alexander has lost eight straight and been outscored 325-to-48. Meigs is currently on a four-game skid in which the Marauder defense has allowed 42.25 points per game. These teams entered last season’s matchup with the same losing skids that they bring into this tilt. 3. The Marauders enter their season finale with a 2-2 record at home this fall. Meigs last finished with a winning record at home in 2015. Alexander has won just one of its last nine road games. 4. So far this season, the Marauders are averaging 126.4 rushing yards and 172.1 passing yards per game, while earning 23.6 points and 14.8 first downs per contest. 5. Through nine games, Zach Bartrum is leading the team on the ground with 576 yards and three touchdowns. Bartrum and Cole Adams are tied for the team lead with 27 receptions apiece, with Adams earning 407 yards and two scores and Bartrum gaining 360 yards with six scores. Cory Cox is the team’s leading passer, with 882 yards and 11 touchdowns. Last Week: Eastern lost to Belpre 49-20, in Tuppers Plains; Southern defeated South Gallia 48-0 in Mercerville. Last meeting between the teams: Oct. 29, 2016. Southern won 41-27 in Tuppers Plains. EHS offense last week: 49 rushing yards, 228 passing yards. SHS offense last week: 236 rushing yards, 90 passing yards. SHS offensive leaders last week: QB Logan Drummer 2-5-0 69 yards, 1TD; RB Riley Roush 11 carries, 125 yards, 3TDs; WR Garrett Wolfe 2 receptions, 27 yards. EHS defense last week: 221 rushing yards, 205 passing yards. SHS defense last week: 78 rushing yards, 12 passing yards. 1. In the last 21 meetings between the two rivals, Eastern holds an 11-10 record over Southern, including a 6-5 record in Racine. The Eagles last defeated SHS on Nov. 1, 2014, by a 28-26 margin in East Shade River Stadium. 2. 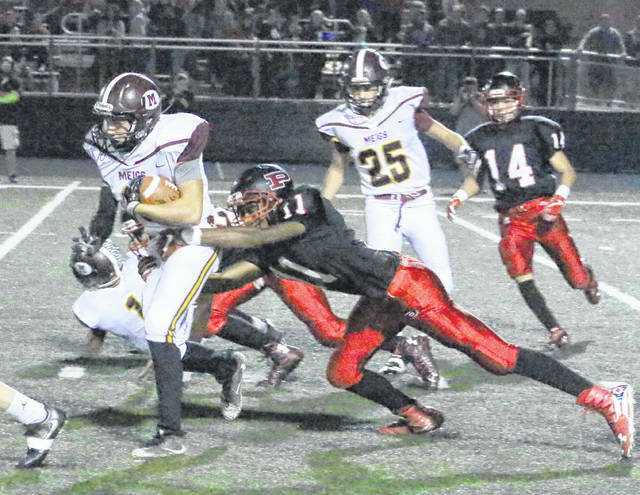 Eastern’s last trip to Roger Lee Adams Memorial Field was on Oct. 31, 2015 and resulted in a 47-7 Tornadoes win. The Eagles last won in Racine on Oct. 29, 2011, by a 27-8 final. Southern enters with a 3-1 home record, while Eastern brings a 2-2 road mark. 3. Both Southern and Eastern have defeated Federal Hocking and South Gallia this fall, while both losing to Miller, Trimble and Waterford. The Tornadoes hold wins over Wahama and Belpre, which both defeated Eastern. 4. Both offense have found more success in the first half this season. Southern has scored an average of 22.1 points before the half while Eastern is averaging 10.7 points in the first 24 minutes. Both teams have scored an average 6.9 points per game after halftime this fall. 5. Southern has surrendered 12.4 points per game this year, while pitching a pair of shut outs. The Eagles have allowed 24.2 points per game this season, with one shut out to its record.